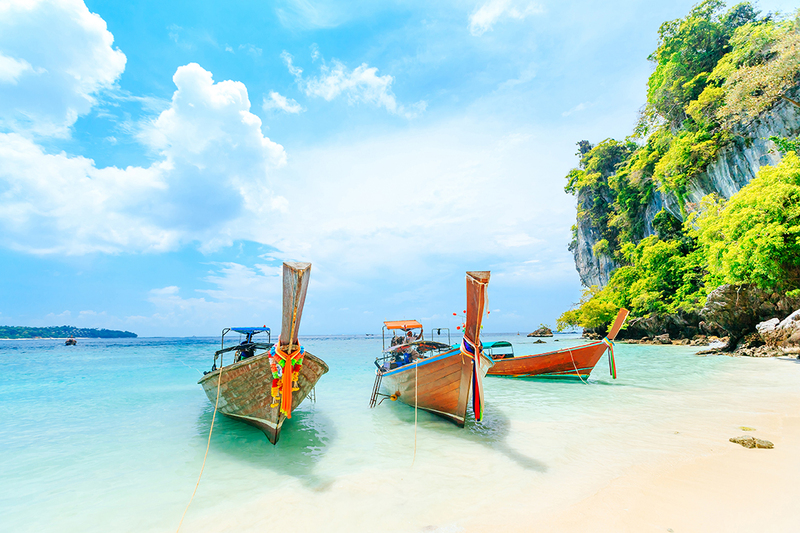 Your 11-night Phuket, Phi Phi Island, & Krabi multi-centre holiday gets underway with your flight from the UK to Phuket. Check into the Casa Del M resort for a five-night room only stay. a tropical modern retreat in a prime location close to Patong Beach, Patong's rainforest and vibrant night entertainment venues. Take a dip in the pool to cool off to have a wander round the beautiful gardens. Alternatively, talk a brief walk to the nearby beach and stroll along the picturesque white sand shore. Next, you'll transfer to Phi Phi Island to check into The Beach Resort for a four-night bed and breakfast stay in a Superior Garden Villa. This idyllic resort sits on peaceful Long Beach which has stunning views across to Maya Bay Island. On-site facilities include an outdoor swimming pool, kids' play area, beach restaurant, beach bar, diving centre, Thai massage service, and complimentary Wi-Fi access throughout. 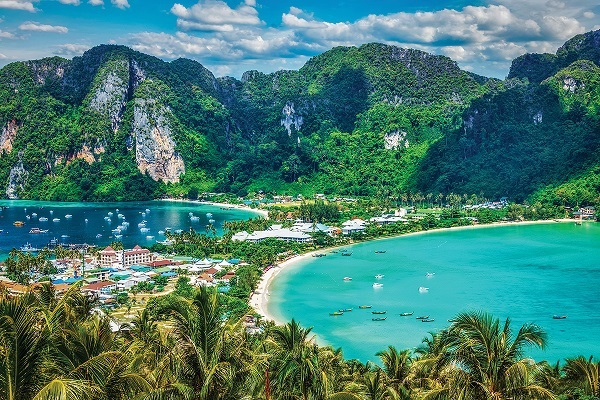 On Day 10 transfer from Phi Phi Island to Krabi and check into Ao Nang Phu Pi Maan Resort & Spa for a two-night bed and breakfast stay. This newly-renovated living lifestyle resort is located in the Ao Nang Beach area of Krabi at the heart of the town's promenade. 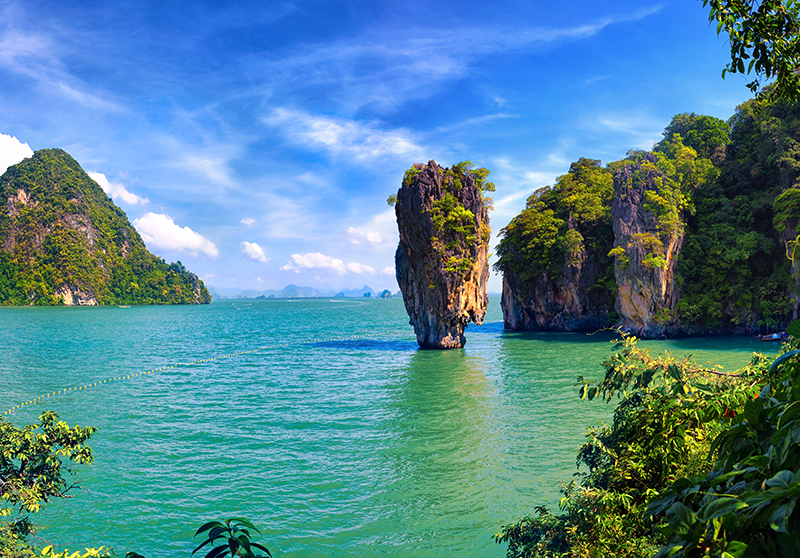 West Railay Beach, Nopparat Thara Beach, Ao Phai Plong, and Ao Nang Krabi Boxing Stadium are easily accessible too. Your holiday comes to an end on Day 12 when you fly back to the UK with many treasured memories to look back on. T&Cs: Transfers & Ferry tickets can be booked locally or prearranged. Phi Phi Island Beach Resort can book transfers from and to the ferry terminal but must be contacted prior to arrival with pick up times. Casa De; M Resort has a range of facilities for your convenience including: complimentary Wi-Fi, car park, room service, indoor pool, outdoor pool, sun terrace, fitness room, spa and massage service, bar, living room, library, garden, lounge, restaurant, meeting facilities, 24-hour reception, babysitting, laundry service, complimentary shuttle service to Patong, airport transfer, excursion desk, car hire, and dry cleaning service. Dine in the restaurant and sample a range of local and international dishes serves al fresco style. The bar and living room offers snacks and there is an extensive drinks menu available. Drinks are served on the terrace and lounge. There is a total of 123 rooms at Casa Del M Resort and room types include superior, deluxe, honeymoon suite and premier pool side. All room facilities include: air-conditioning, bottled water, hair dryer, ironing facilities, satellite TV, shower, desk, safe, minibar, seating area, tea and coffee making facilities, complimentary Wi-Fi access, fridge, dining area, and balcony or terrace. 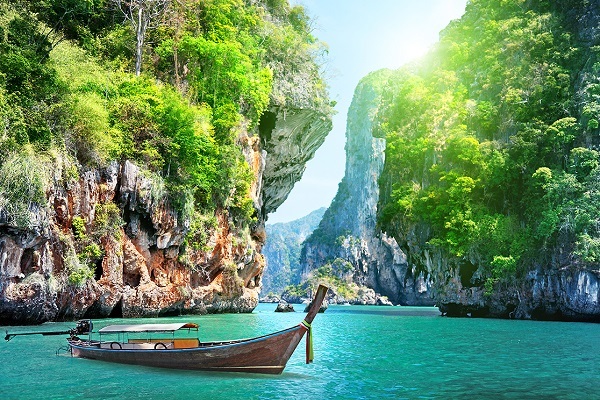 Take the ferry from Phuket to Phi Phi Island. Transfer to The Beach Resort and check-in for a four-night bed and breakfast stay in a Superior Garden Villa. This idyllic resort sits on the peaceful Long Beach which boasts stunning views across to Maya Bay Island and beyond. The plethora of on-site facilities include: an outdoor swimming pool, kids' play area, beach restaurant, beach bar, diving centre, laundry service, room service, long tail and speed boat service, sightseeing and tours, Thai massage service, daily activity programme, complimentary Wi-Fi access throughout, and high-speed Internet at the Lobby. The reception is open from 07:00 to 23:00 and offers a porter, concierge, telephone, and transfers to Phuket, Krabi, and Koh Lanta. The Beach Restaurant opens daily from 11:00 to 22:00 and serves a menu of Thai, Western and BBQ dishes plus fresh seafood on the beach each evening. Private dining can also be arranged for special occasions on request. Let's Sea Beach Bar is the place for tasty cocktails and evening fire shows with DJs to entertain you until 01.30am on the beach. There are a total of 105 contemporary guest villas at The Beach Resort, ranging from Superior Villas and Superior Villas with Partial Sea View to Deluxe Villas. Superior Villas feature an electronic safe, cable television, individually-controlled air-conditioning, bathroom with shower, complimentary minibar with drinks, coffee/tea making facilities, telephone, hairdryer, bathrobe, umbrellas, private balcony with sun bed, daily maid service, and complimentary Wi-Fi access. Transfer from Phi Phi Island to Krabi and check into Ao Nang Phu Pi Maan Resort & Spa for a 2 night stay on a Bed and Breakfast basis. This small and tranquil resort is located in the Ao Nang area of Krabi; just a five-minute shuttle ride away from Ao Nang Beach and a 15-minute longtailboat ride from the beautiful Tonsai, Railay, and Phra Nang beaches. 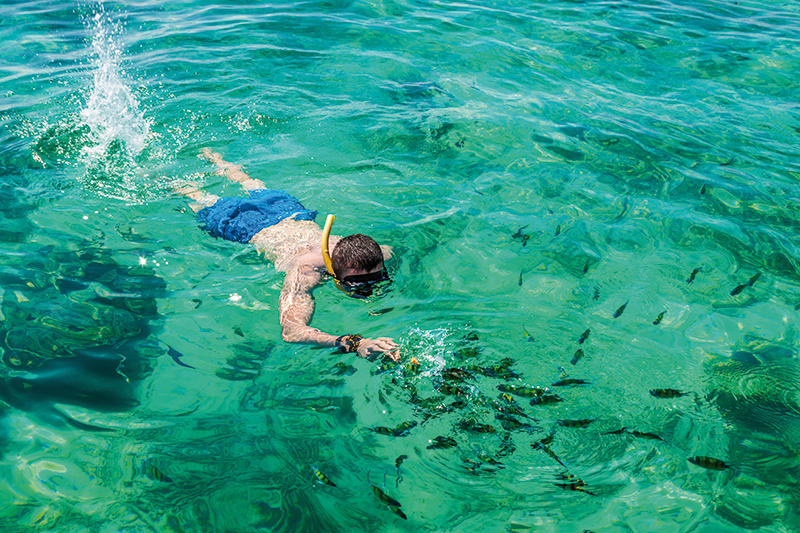 You'll also have easy access to James Bond Island and also island hopping and snorkelling trips around the nearby Bamboo Island, Koh Hong, and Phi Phi Islands by longtailboat. Ao Nang Phu Pi Maan Resort & Spa offers the perfect space to unwind. You'll find an outdoor swimming pool, sun terraces, gardens, restaurant, snack bar, pool bar, health spa with Thai massage and fitness centre, 24-hour reception, concierge, tour desk, library, children's club, computer station, luggage storage, dry cleaning/laundry service, shuttle service, and complimentary Wi-Fi access. There are 24 luxurious guest rooms and villas at across ten categories. Deluxe Rooms feature a king-size bed or twin single beds, individually controlled air-conditioning, 32-inch wide-screen LED satellite television, personal safe, hairdryer, minibar fridge, complimentary daily minibar/drinking water, desk, coffee and tea making facilities, torch, umbrella, and daybed/sofa. The large bathroom offers a separate over-sized bathtub with walk-in rain shower, cotton bathrobe and slippers, and toiletries. Guide price is per person. Based on 2 people sharing for 11 nights on Room Only and Bed & breakfast. Flying from regional airports. Year round departures. Overseas transfers available.